Anthology selected, sequenced and remastered at the Serenity Studio, Belgium in July 2004.
vidnaObmana : Electronics and atmospheres, tapes, rhythms and voices. Noise/Drone Anthology 1984-1989 is the 2nd release for vidnaObmana’s Ikon label in conjunction with Projekt. 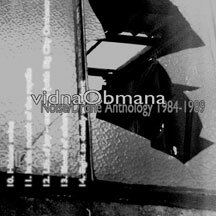 After the well-received 20th anniversary anthology, vidnaObmana selected and re-mastered rare and unreleased pieces from his obscure and unfamiliar noise and experimental phase between 1984 and 1989. All pieces were taken from old cassette masters and unreleased studio sessions, thus a lot of time and energy was invested in securing a high sound quality for this CD release. Expect a provoking combination of early drone and atmospheric pieces with sonic assaults of noise and vocal experiments. The collection includes collaborative pieces with cassette-network pioneers Kapotte Muziek, PBK and Big City Orchestra. An essential compilation that re-confirms vidnaObmana’s significance in the independent electronic and experimental music scene. It also shows the listener vidnaObmana’s early foundation in meditative music, the path that followed over the next 20 years.